I got a call at about 11.00 yesterday morning from one of the Leabridge Safer Neighbourhoods officers (Pc343GD). She was responding to the message I'd left on the dedicated phone number (07884 117293) the previous morning about Thursday's hit-and-run accident and the curious case of the motorcyclist who came down my street shortly afterwards, shedding his leathers and other garments and dumping them in various receptacles. The officer apologised for taking a day to get back to me - she'd been off since Saturday and was just catching up - and said that, in her opinion, the biker's jacket and fleece which I now have in my, er, custody, were very likely to be of interest to the officers investigating the case. These officers would be from the Traffic department and she would contact them on my behalf, although that could be tricky over the weekend. I look forward to hearing from them. Watch this space. 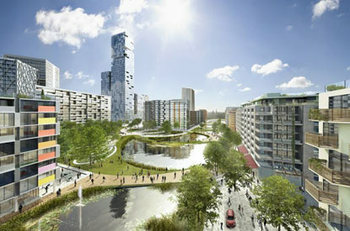 From the Evening Standard, this is what the 2012 Olympic Village is intended to look like. It will cost £2 billion and house 17,000 athletes, none of them above the eighth floor because, apparently, trudging up stairs or waiting for lifts does their legs in (some athletes...). Afterwards it will become what Olympic Delivery Authority Chief Executive David Higgins calls "a legacy community", comprising 3,800 homes (of which 30 percent will be "affordable", whatever that ends up meaning), a healthcare centre and an "education campus" with primary, secondary and nursery school provision. 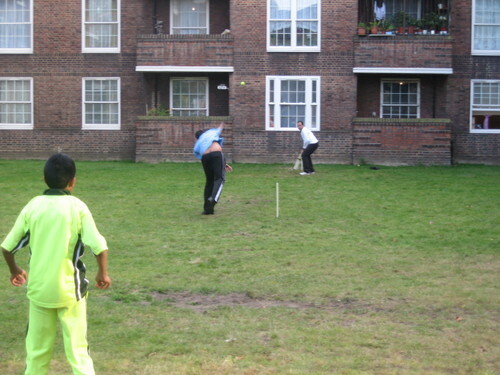 The promise is that the post-Games village will reconnect communities in Hackney, Waltham Forest, Stratford and Leyton. We'll see. Meanwhile, work on the Olympic Park continues. Diamond Geezer has been logging the details. "It's been two months since the Olympic Park was sealed off and its occupants ejected. Two months since an impenetrable big blue wall was erected all around the perimeter, and a bored-stupid security guard posted at every entrance gate. Two months may not sound long, but it represents more than 3% of all the available construction time. So what's been going on here since July? Is the site still a ghost town of crumbling warehouses, or have the Olympic Delivery Authority and their big yellow bulldozers been busy? It's a bit of both, actually." At round about 4.00 yesterday afternoon a builder who is doing some work on my house saw a man behaving strangely in the street. The man was shedding the motorcycle gear he was wearing and concealing it. His leather trousers were shoved into a bin eight doors down, his jacket into an immediate neighbour's (see pic). He threw the grey fleece he had on beneath the jacket into a nearby skip. The builder, looking on, unsurprisingly thought this behaviour strange. After the stripped-down biker left he nipped round the corner onto Lower Clapton Road, where something seemed to be going on. There had been an accident on the lethal junction with Downs Road. A pedestrian had been knocked down by a motorcycle. Its rider had run away. By then, an ambulance and several police officers were on the scene. The builder told one of the officers what he'd seen. The reply was that they were about to go in search of the hit-and-runner, but that someone would be round to my house later. No one came. This morning, the leather jacket was still in the neighbour's bin. I decided to remove both it and the grey fleece from the skip and to phone our local beat policemen (07884 117293). Just after 9.00 I left a message, including details of what had occurred. No one has got back to me yet and a bin bag containing the jacket and fleece is sitting on the floor beside me. Oh well. Maybe the hit-and-runner has been caught. Maybe the clothes would be of no help to the police. But I wonder what, if anything, will happen next. Facing on to Downs Park Road. Competitive Dad appears to be involved. There were slices of pineapple and cubes of carrot cake. There were two inspectors from the Audit Commission. There were two park-users and two sports co-ordinators, an actor, an archivist, a library-lobbyist, a woman who trains at the King's Hall, and there was me. It all took place in the Gold Suite at the Town Hall: a focus group consultation about the Council's delivery of cultural services in all their variety, from street decor to theatres to astroturf. One of the men from the AC drew a picture of a mountain on a huge piece of paper and invited each of us to stick a green dot on the part of it that represented our opinion of Hackney's performance. If we thought they were improving our dot was to be stuck on the left-hand slope; if worsening, on the right. We all went for the "up" side: some higher up than others and none close to the top, but none among the felt-pen tents at base camp either. Just about everyone there was more entitled to an opinion than me - I think I was only asked because I've got a lot of kids and smile nicely when I take them for swimming lessons - so I was pleased that my impressions were in line with theirs. "Five years ago, I'd have put mine at the bottom," said one of the more seasoned observers. A Gold Star from the Gold Suite group, then. Anybody care to disagree? Eleven years ago there was a split in Hackney Council's customary ruling Labour group, resulting in several councillors breaking away to form a new block. 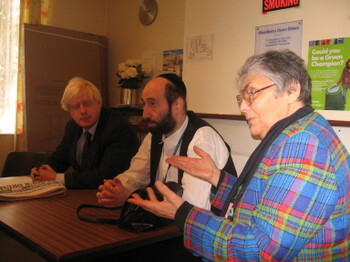 Cheekily, they called themselves "Hackney New Labour" and formed alliances with other parties against official Labour. The story of why this happened and who was to blame for the ensuing years of bedlam in Council affairs is disputed in every detail by everyone involved to this day and will be for evermore. 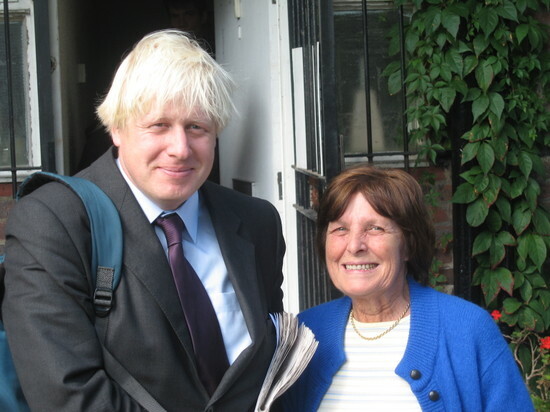 Hence, a recent post by blogging councillor Akehurst on the Liberal Democrats' selection of former Hackney Councillor Meral Ece to fight the Hackney, Islington & Waltham Forest Greater London Assembly seat next May. Be sure to read the comment thread. It's a gorefest. 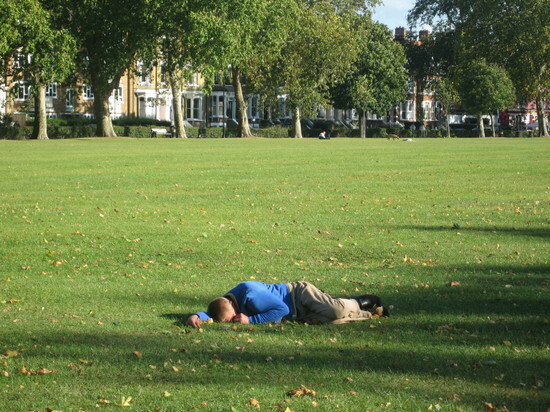 I took this yesterday afternoon, round about 4.30, while walking across Hackney Downs with my three youngest. The breeze was light, the sun bright, the shadows long. It was a beautiful scene; and so sad that a crashed-out man was part of it. "Three weeks in, how's the new school year panning out? Don't even get me started. But suffice to say that the school has a room they put you in if you've been Bad - I think they see it as an alternative to suspension (now starkly called 'exclusion'). It's called - geddit?!? - the 'Inclusion Room'. So we HAVE learned something from George Orwell! My friend's kid was in there for a whole day last week. He didn't get to go out for lunch, and he never went to the toilet either (though he didn't ask, so maybe they'd have let him), all the while his mother was trying desperately to ring the school. She had had a missed call, but no message and no clue as to who was trying to call her. Numerous calls to the main number yielded no information. While she was doing this, her kid was spending an entire day with nothing at all to do beyond one sheet of English (even secondary school work comes in 'sheets' now, not 'books'), locked in a room. What the school told her...was that until she (in the throes of her own full-time, and full-on, job as a social worker) could find the time to somehow procure a pair of size 13 'school shoes', her son would even not be allowed to go to school. They told her, 'We have legal precedent on our side.'" Until a few years ago SNS was a non-uniform school. When it changed that policy - one of my sons was there at the time - the rules were interpreted quite liberally. Ms B's friend's experience suggests that they've now been tightened considerably, bringing them more into line with Mossbourne's code. Is this part of a response by SNS head Mark Emmerson to Mossbourne's success? What are readers' views about our changing array of secondary schools? Please let me know!